Download "Authorisation and Restriction Newsletter"
3 3 The aim of this guide REACH i aims at ensuring a high level of protection of human health and the environment as well as the free movement of substances, on their own, in mixtures and in articles, while enhancing competitiveness and innovation. REACH should also promote the development of alternative methods for the assessment of hazards of substances (Recital (1)). A main objective is to establish a coherent registration system designed to identify relevant risk management measures based on hazard and risk information on new and existing chemical substances manufactured in or imported into the EU. In parallel REACH Regulation provides the maintenance of the existing restriction system and the introduction of an authorisation process. So, both are regulatory instruments for authorities to manage the risks of hazardous chemicals under REACH. They ensure a Community wide control of substances. 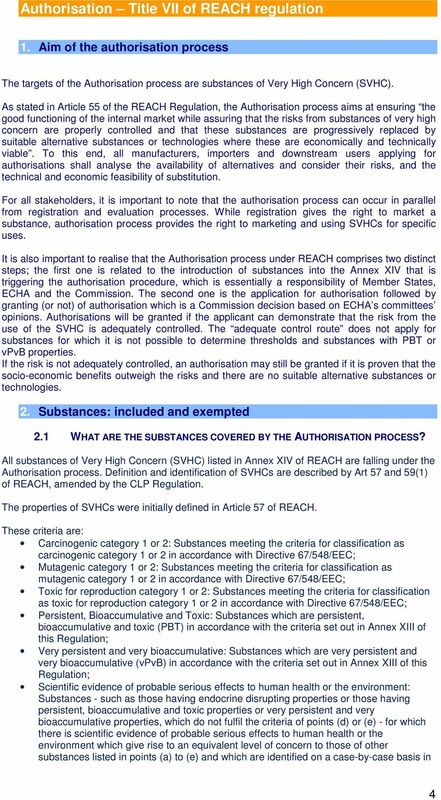 The Authorisation process a new tool within the Community chemicals legislation - starts with the identification of substances of very high concern (SVHC) by Member State Competent Authorities or the European Chemicals Agency, ECHA, (on behalf of the European Commission) by preparing a dossier in accordance with Annex XV. 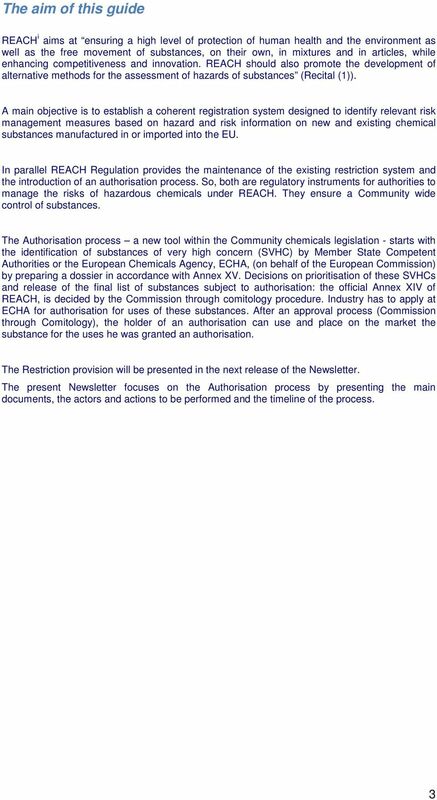 Decisions on prioritisation of these SVHCs and release of the final list of substances subject to authorisation: the official Annex XIV of REACH, is decided by the Commission through comitology procedure. Industry has to apply at ECHA for authorisation for uses of these substances. After an approval process (Commission through Comitology), the holder of an authorisation can use and place on the market the substance for the uses he was granted an authorisation. The Restriction provision will be presented in the next release of the Newsletter. 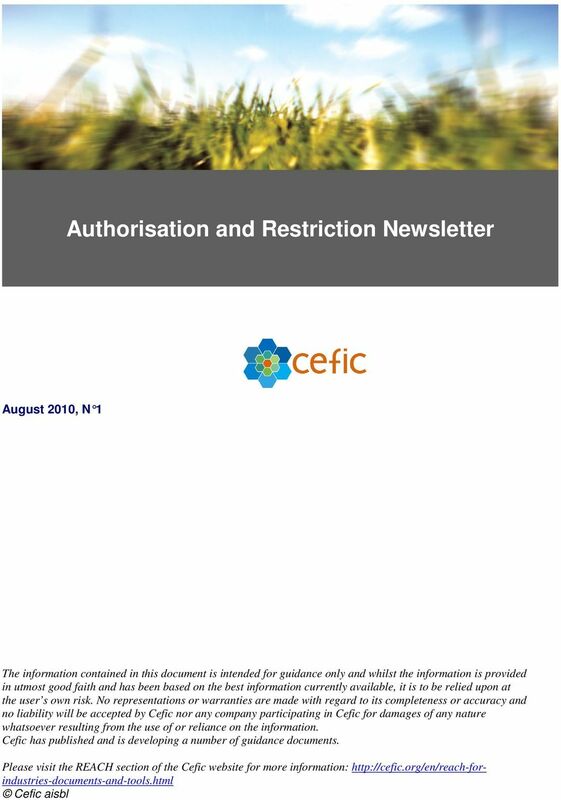 The present Newsletter focuses on the Authorisation process by presenting the main documents, the actors and actions to be performed and the timeline of the process. 5 5 accordance with the procedure set out in Article 59. There is no tonnage threshold for a substance subject to authorisation. Art 58 of Regulation (EC) N 1272/2008 on Classification, Labelling and Packaging of Substances and Mixtures (the so called CLP Regulation) provides amendments to REACH from1 December Article 57(a), (b) and (c) shall be replaced by the following: - Substances meeting the criteria for classification in the hazard class carcinogenicity category 1A or 1B in accordance with section 3.6 of Annex I to Regulation (EC) No 1272/2008; - Substances meeting the criteria for classification in the hazard class germ cell mutagenicity category 1A or 1B in accordance with section 3.5 of Annex I to Regulation (EC) No 1272/2008; - Substances meeting the criteria for classification in the hazard class reproductive toxicity category 1A or 1B, adverse effects on sexual function and fertility or on development in accordance with section 3.7 of Annex I to Regulation(EC) No 1272/2008; 2.2 WHAT ARE THE GENERAL EXEMPTIONS? Some uses of substances are exempted from the provisions of authorisation by article 2 and Title VII of REACH. These uses of substances are already regulated under specific provisions. The following uses of substances subject to authorisation are exempted ii Medicinal products for human or veterinary use Food or feeding stuffs including uses as food/feed additives and as flavouring in foodstuffs As on-site isolated intermediates and transported isolated intermediates Substances used for scientific research and development. PPORD activities may be exempted on a case by case basis only during the process of inclusion in Annex XIV Substances used for plant protection products, biocides, Motor fuel and certain fuels used in closed systems However if a substance is manufactured or imported for the above mentioned uses as well as for other uses, the uses not described above are not exempted and have to fulfil the authorisation provisions. 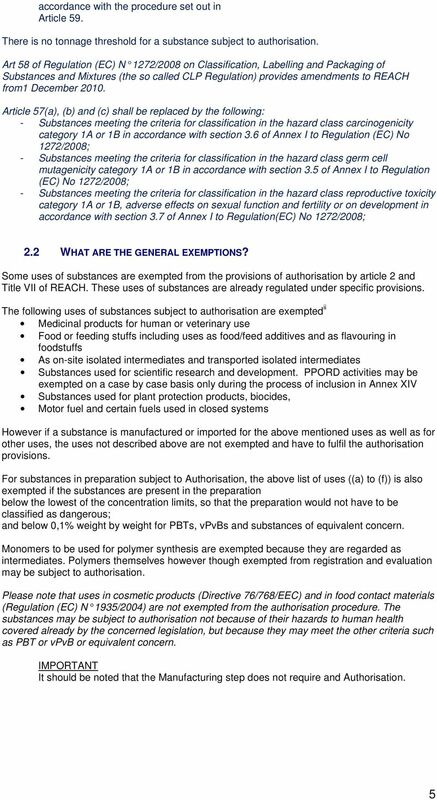 For substances in preparation subject to Authorisation, the above list of uses ((a) to (f)) is also exempted if the substances are present in the preparation below the lowest of the concentration limits, so that the preparation would not have to be classified as dangerous; and below 0,1% weight by weight for PBTs, vpvbs and substances of equivalent concern. Monomers to be used for polymer synthesis are exempted because they are regarded as intermediates. Polymers themselves however though exempted from registration and evaluation may be subject to authorisation. Please note that uses in cosmetic products (Directive 76/768/EEC) and in food contact materials (Regulation (EC) N 1935/2004) are not exempted from the authorisation procedure. The substances may be subject to authorisation not because of their hazards to human health covered already by the concerned legislation, but because they may meet the other criteria such as PBT or vpvb or equivalent concern. IMPORTANT It should be noted that the Manufacturing step does not require and Authorisation. 8 8 5. Main stages of the Authorisation process for inclusion of substances in Annex XIV 30 days 60 days 15 days 30 days 90 days 120 days* Dossier XV Received /finalised Publication Annex XV (transmission to MS) End Public consultation (also MS comments) Transmission to MS Committee Opinion MS Committee 90 days 60 days* 90 days* 180 days* Commission s proposal Commission s decision (Art.133.3) INCLUSION CANDIDATE LIST Publication of ECHA recommendations (public consultation) Transmission to MS Committee ECHA transmits recommendation to Commission Commission s proposal Commission decision (Art.133.4) WTO notification Sunset date End public consultation INCLUSION ANNEX XIV * = Minimum estimated 5.1 STAGE 1 - IDENTIFICATION OF SVHCS ESTABLISHMENT OF THE CANDIDATE LIST In the RoI, a Member State or the Agency (on request of the European Commission) indicates an intention, with an explanation, to submit an Annex XV dossier. Proposals for substances to be considered as SVHC will be made via the submission of the Annex XV dossier for the substance. The dossier will contain among other information, a justification for the proposal why it is fulfilling the criteria to be a SVHC. At that stage, interested parties can comment on substances for which such dossier have been presented. Dossiers and comments are reviewed by the Member States Committee and eventually agreed upon. The outcome of this identification process is a list of substances, which are candidates for prioritisation this list is called the Candidate List. The Candidate List is published and periodically updated by ECHA on the Agency web site. 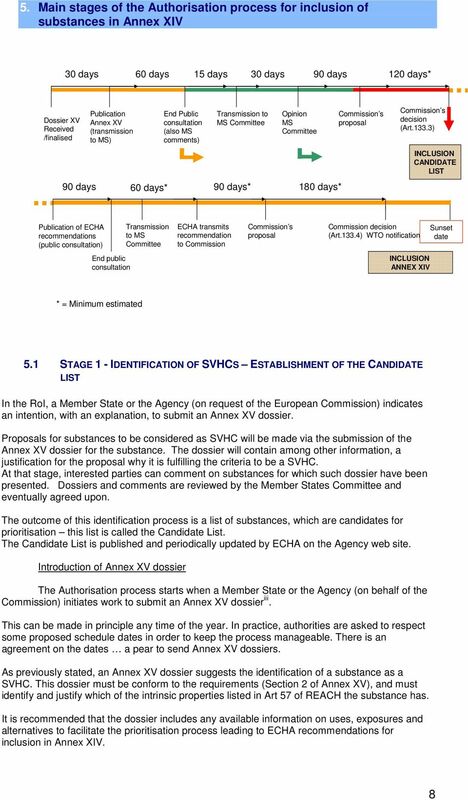 Introduction of Annex XV dossier The Authorisation process starts when a Member State or the Agency (on behalf of the Commission) initiates work to submit an Annex XV dossier iii. This can be made in principle any time of the year. In practice, authorities are asked to respect some proposed schedule dates in order to keep the process manageable. There is an agreement on the dates a pear to send Annex XV dossiers. As previously stated, an Annex XV dossier suggests the identification of a substance as a SVHC. This dossier must be conform to the requirements (Section 2 of Annex XV), and must identify and justify which of the intrinsic properties listed in Art 57 of REACH the substance has. 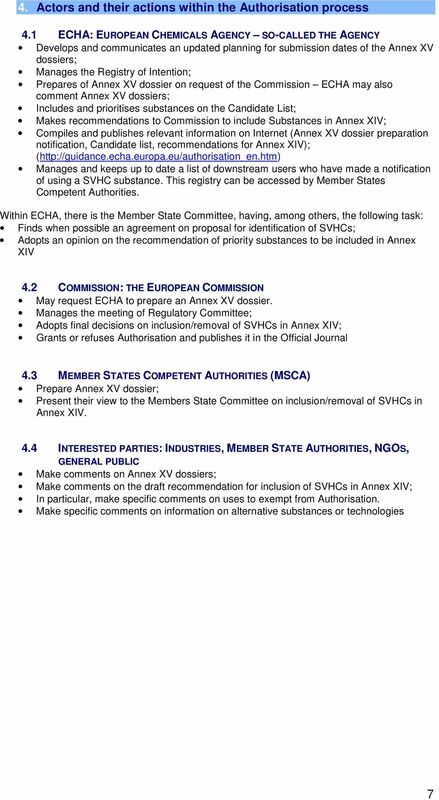 It is recommended that the dossier includes any available information on uses, exposures and alternatives to facilitate the prioritisation process leading to ECHA recommendations for inclusion in Annex XIV. 9 9 However, please note that Annex XV dossiers are not only based on registration dossiers but also on existing knowledge. So, substances outside the scope of the registration or substances not yet registered can be proposed for inclusion to the Candidate List. First public consultation (on Annex XV dossiers) A 45-days period offers the possibility to interested parties as well as Member States to comment and/or give additional information. The comments can only be done via the web form on the ECHA website, and it s mandatory to respect the different fields within the form. Companies should use this possibility to provide comments on uses, exposures and alternatives, information which could be taken into account by ECHA in the priority setting. It is important to understand that this information will not affect the discussion whether the substance fulfils the requirements of SVHC. Opinion of Member States Committee/ Decision of Commission When the dedicated period is over and no comment has been made, the substance is placed automatically into the Candidate List. However, if there is any comment, ECHA forwards the dossier to the Member States Committee (within 15 days) which has 30 days to reach unanimous agreement. 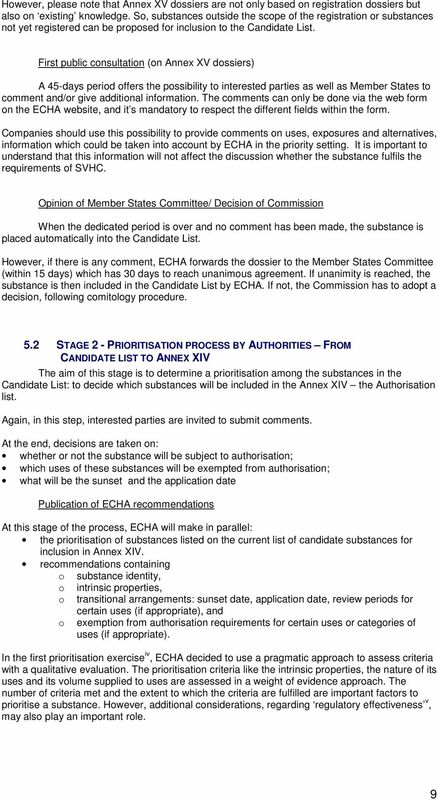 If unanimity is reached, the substance is then included in the Candidate List by ECHA. If not, the Commission has to adopt a decision, following comitology procedure. 5.2 STAGE 2 - PRIORITISATION PROCESS BY AUTHORITIES FROM CANDIDATE LIST TO ANNEX XIV The aim of this stage is to determine a prioritisation among the substances in the Candidate List: to decide which substances will be included in the Annex XIV the Authorisation list. Again, in this step, interested parties are invited to submit comments. 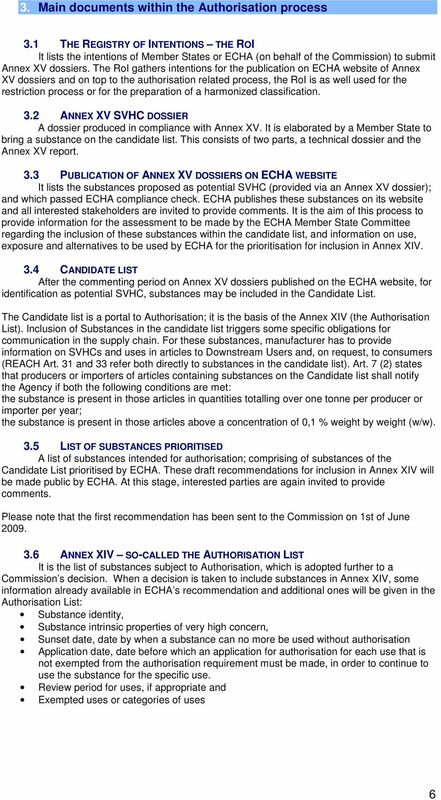 At the end, decisions are taken on: whether or not the substance will be subject to authorisation; which uses of these substances will be exempted from authorisation; what will be the sunset and the application date Publication of ECHA recommendations At this stage of the process, ECHA will make in parallel: the prioritisation of substances listed on the current list of candidate substances for inclusion in Annex XIV. recommendations containing o substance identity, o intrinsic properties, o transitional arrangements: sunset date, application date, review periods for certain uses (if appropriate), and o exemption from authorisation requirements for certain uses or categories of uses (if appropriate). In the first prioritisation exercise iv, ECHA decided to use a pragmatic approach to assess criteria with a qualitative evaluation. The prioritisation criteria like the intrinsic properties, the nature of its uses and its volume supplied to uses are assessed in a weight of evidence approach. The number of criteria met and the extent to which the criteria are fulfilled are important factors to prioritise a substance. However, additional considerations, regarding regulatory effectiveness v, may also play an important role. 10 10 It should be noted that the decision not to prioritize a substance is only valid for the actual priority setting procedure. This substance may be re-considered in a later priority setting procedure. Second public consultation Due to REACH text and prior to the submission of recommendations to the Commission, ECHA must publish the draft recommendation with the prioritised substances on its web for comments by interested parties during a 3-month period. The comments can, for example, be made on Exemptions of uses, Information on uses, alternatives and risk assessment, Socio-economic information, Grouping of Substances After the consultation period, the Member State Committee gives an opinion on the recommendation drafted by the Agency. In order to prepare the discussion within the Member States Committee, the appointed rapporteur (a Member State, optionally a working group) will draft the opinion on the recommendation and stakeholder inputs. Then, the discussion starts and the Member States Committee will forward the opinion to the Agency. 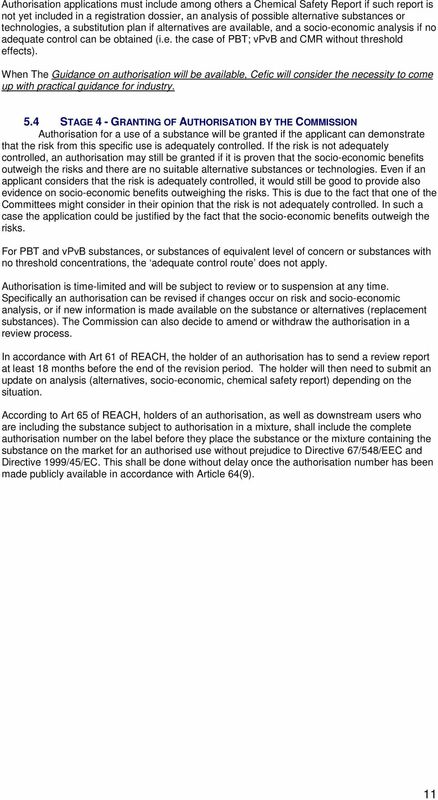 Transfer of ECHA recommendations to Commission ECHA forwards its recommendations of SVHC substances to the Commission in order to include those substances in the Authorisation list. 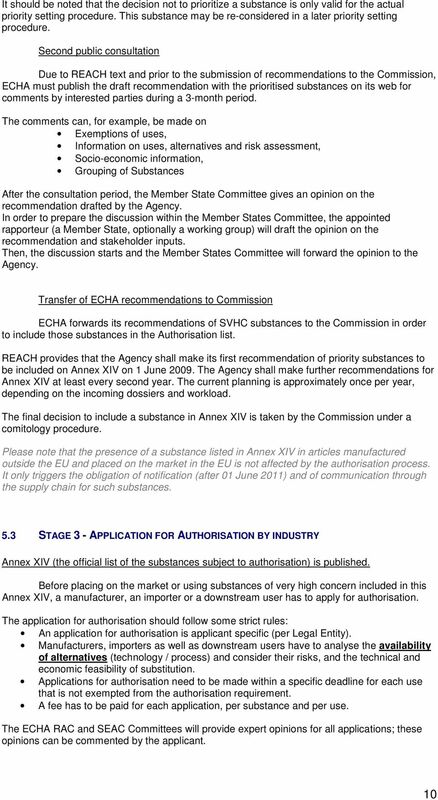 REACH provides that the Agency shall make its first recommendation of priority substances to be included on Annex XIV on 1 June The Agency shall make further recommendations for Annex XIV at least every second year. The current planning is approximately once per year, depending on the incoming dossiers and workload. The final decision to include a substance in Annex XIV is taken by the Commission under a comitology procedure. Please note that the presence of a substance listed in Annex XIV in articles manufactured outside the EU and placed on the market in the EU is not affected by the authorisation process. It only triggers the obligation of notification (after 01 June 2011) and of communication through the supply chain for such substances. 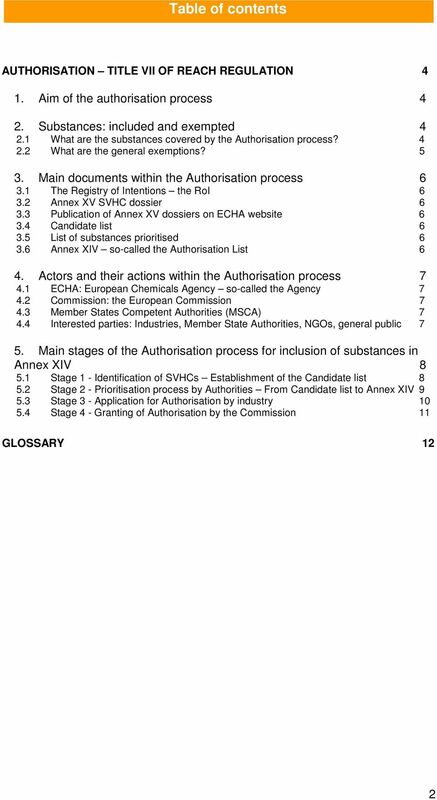 5.3 STAGE 3 - APPLICATION FOR AUTHORISATION BY INDUSTRY Annex XIV (the official list of the substances subject to authorisation) is published. 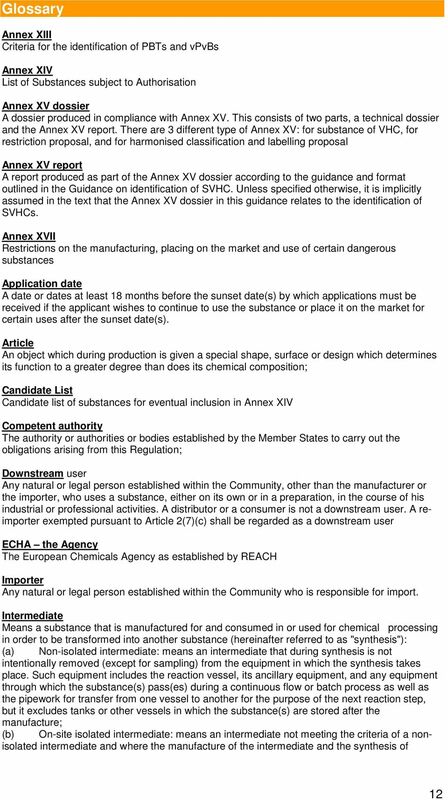 Before placing on the market or using substances of very high concern included in this Annex XIV, a manufacturer, an importer or a downstream user has to apply for authorisation. The application for authorisation should follow some strict rules: An application for authorisation is applicant specific (per Legal Entity). Manufacturers, importers as well as downstream users have to analyse the availability of alternatives (technology / process) and consider their risks, and the technical and economic feasibility of substitution. Applications for authorisation need to be made within a specific deadline for each use that is not exempted from the authorisation requirement. A fee has to be paid for each application, per substance and per use. The ECHA RAC and SEAC Committees will provide expert opinions for all applications; these opinions can be commented by the applicant. 11 11 Authorisation applications must include among others a Chemical Safety Report if such report is not yet included in a registration dossier, an analysis of possible alternative substances or technologies, a substitution plan if alternatives are available, and a socio-economic analysis if no adequate control can be obtained (i.e. the case of PBT; vpvb and CMR without threshold effects). When The Guidance on authorisation will be available, Cefic will consider the necessity to come up with practical guidance for industry. 5.4 STAGE 4 - GRANTING OF AUTHORISATION BY THE COMMISSION Authorisation for a use of a substance will be granted if the applicant can demonstrate that the risk from this specific use is adequately controlled. If the risk is not adequately controlled, an authorisation may still be granted if it is proven that the socio-economic benefits outweigh the risks and there are no suitable alternative substances or technologies. Even if an applicant considers that the risk is adequately controlled, it would still be good to provide also evidence on socio-economic benefits outweighing the risks. This is due to the fact that one of the Committees might consider in their opinion that the risk is not adequately controlled. In such a case the application could be justified by the fact that the socio-economic benefits outweigh the risks. For PBT and vpvb substances, or substances of equivalent level of concern or substances with no threshold concentrations, the adequate control route does not apply. Authorisation is time-limited and will be subject to review or to suspension at any time. Specifically an authorisation can be revised if changes occur on risk and socio-economic analysis, or if new information is made available on the substance or alternatives (replacement substances). The Commission can also decide to amend or withdraw the authorisation in a review process. In accordance with Art 61 of REACH, the holder of an authorisation has to send a review report at least 18 months before the end of the revision period. The holder will then need to submit an update on analysis (alternatives, socio-economic, chemical safety report) depending on the situation. 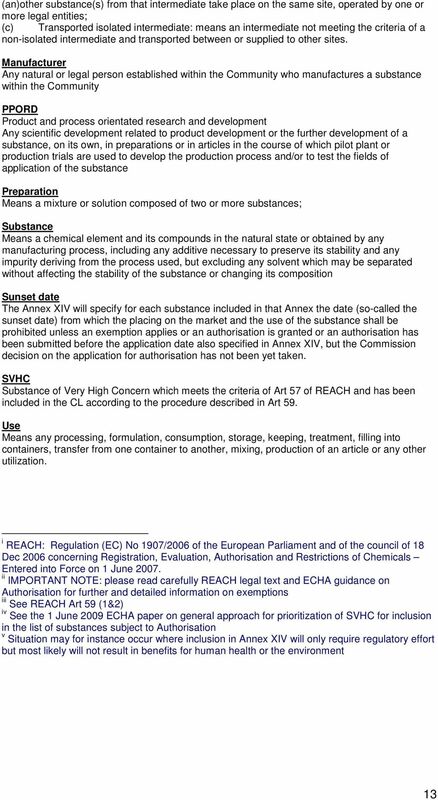 According to Art 65 of REACH, holders of an authorisation, as well as downstream users who are including the substance subject to authorisation in a mixture, shall include the complete authorisation number on the label before they place the substance or the mixture containing the substance on the market for an authorised use without prejudice to Directive 67/548/EEC and Directive 1999/45/EC. This shall be done without delay once the authorisation number has been made publicly available in accordance with Article 64(9).